Old Ridgefield: What is the 'range' of a bird? What does “range” mean when talking about a species of bird? The range of a bird species is the territory in which one would expect to find it living at one time of the year or another. Ranges vary from small areas of less than the size of Rhode Island to nearly the entire world. Several factors determine a species’ range, chief among them the climate and the kind of soil. Climate and soil affect the kind of vegetation that grows, and vegetation is the source of food, nesting sites and materials, and protection for most birds. Few birds can survive in the desert, where vegetation is spare, but some have adapted to it. Other birds require the sea, or at least lakes or rivers, for their survival. Various factors also limit range. Oceans are the most obvious; few birds are capable of crossing an ocean under normal conditions. Temperature limits range; few birds can survive an Arctic or Antarctic winter, for instance. High mountains define some range boundaries -- many species are found either east or west of the Rockies. part of the Red Knot's range. Many birds migrate and their territory includes a “summer” or “breeding” range and a winter range. Often the summer and winter ranges overlap so that a species might live year round in some states or provinces while in other regions, the birds appear only in summer or winter. In the case of such species as the Tundra Swan and the Snow Goose, summer and winter ranges are widely separated. Although during migration these birds fly over a lot of land and may stop for a bite to eat on the way to and from ranges, the territory in between the winter and summer grounds is not considered part of its range. 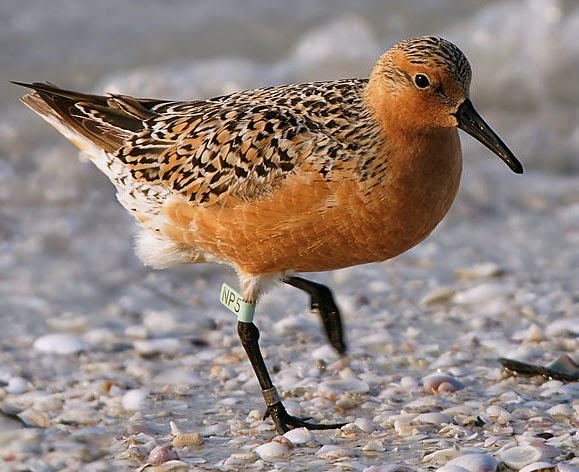 For example, the Red Knot has a winter range at the southern tip of South America and a summer range in the northern Arctic. While it can be seen on Connecticut shores in March, Connecticut is just a brief stopover on its long way north and not part of its range.